There's no doubt that bringing a German shepherd into my home was one of the best decisions I ever made. But I work in the veterinary field, and my job has made me acutely aware of the importance of finding a responsible German shepherd breeder. Responsible breeders choose to breed healthy and emotionally balanced dogs, which improves the quality of the dog breed and reduces the number of dogs that end up in shelters with health problems that owners can’t afford. But how do you find a responsible breeder? After talking with vets and experts in the field like the German Shepherd Dog Club of America and the Humane Society, I discovered there are 10 things to look for in a German shepherd breeder that can help narrow down the list. If you are thinking about bringing a German shepherd into your home, the first thing you should consider is adoption. There are countless German shepherds out there in need of a good home who deserve a chance at your heart, and you have nothing to lose by contacting a shelter or adoption agency. If you're having trouble finding a German shepherd in your local shelter, try searching for a GSD-specific adoption center. You may have to drive a little further out, but there are plenty of rescue shelters that cater to just German shepherds. A responsible breeder will be transparent about any health problems in the bloodline and will test for hip and elbow problems, as the breed is prone to hip and elbow dysplasia. A great breeder will perform additional tests for other health problems, going above and beyond what is recommended by the AKC. Don't purchase a puppy unless the breeder has had the parents evaluated by a veterinarian and gone through the OFA certification for their hips and elbows, and don’t be afraid to ask to see the records. One of the best ways to determine what kind of dog your puppy will grow up to be is to meet their parents, grandparents or puppies from other litters. Most breeders have at least the mother on the premises, and some will have detailed descriptions of where dogs from previous litters have ended up on their websites. If you can, visit the breeder’s facility. The kennel should be clean, and the puppies should be active and healthy. Malnourished, dirty, weak or skinny puppies are signs that the breeder is not taking proper care of their dogs, and is a major red flag. German shepherd puppies need socialization from a young age. Ask the breeder if the puppies have been exposed to children, other dogs and other animals. While you can certainly socialize your new puppy when you take it home, it never hurts to get a head start, especially with naturally protective dog breeds like the German shepherd. Your breeder should have an up-to-date vaccination record for the puppy, and you should receive a copy of it. 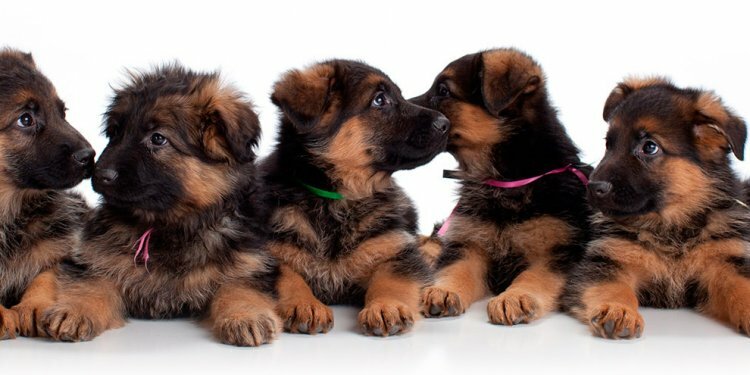 If your German shepherd puppy has not received any vaccines or veterinary care, you should look for a different breeder no matter how cute the puppy is. Looks are not everything. German shepherds come in a variety of coat colors, but don’t let a desire for a particular coloring be the only factor you consider in a breeder. On the other hand, some aspects of appearance do matter. Dogs with poor conformation (that is, an exaggerated sloped back) or unhealthy-looking coats could have underlying health problems. You need to know what you want before you contact a breeder. Are you interested in a male or a female? Do you want to compete in a dog sport or show your puppy? Do you want to breed your puppy? Do you have small children or other pets in the house? These are the types of questions that can help the breeder select a puppy they think will be a good fit for you. Breeding puppies is not cheap. The veterinary bills, food bills and the time commitment necessary to produce a high-quality, healthy puppy are substantial. If you are looking for a cheap German shepherd puppy, consider adopting. Ask around your community for information about German shepherd breeders. Your vet might know of a good breeder in the area and can also caution you against breeders that regularly produce unhealthy or emotionally unstable dogs. Supporting irresponsible breeders just perpetuates the health problems German shepherds face. When it comes to bringing a German shepherd — or any dog — into your life, there are only two choices that conscientious dog lovers can make: We can adopt, or we can support the breeders who are trying to improve the breed.